Washington growers have begun swathing 1st cutting Timothy. The Columbia Basin Timothy harvest is slightly ahead of that in the Kittitas Valley. The weather has been good thus far allowing growers to move swiftly through harvest activities. Most areas across both the basin and the valley will be cutting through the weekend. Across the Western United States, Alfalfa harvest is in full swing. In the Pacific Southwest (PSW) most growers are already busy with 4th cutting Alfalfa harvest. Temperatures are rising throughout the area. We are seeing a decline in the quality of the 4th cutting as the Southern United States heats up. As we push further into the summer months, we will continue to see a decline in the quality of hay from this region. In other areas of the west however, 1st cutting Alfalfa harvest has just begun. Nevada, Utah, Oregon, Idaho and Washington have all begun harvest activity in the last few weeks. In most areas the weather has been cooperating. The quality should be very good as long as the weather holds through baling. Some areas of Washington had some rain fall during initial harvest activities. The Columbia Basin received rain immediately following the 1st cutting of the earliest fields. Of the first fields that were cut in the Columbia Basin, about 80% received rain. The majority of this hay will not meet export quality. Due to the delays cause by rainfall, the fields that remained uncut are now mature. 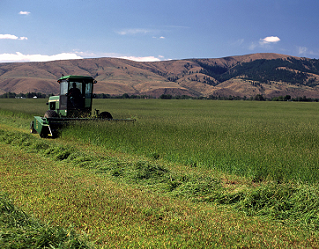 We expect the supply of 1st cutting Alfalfa from the Columbia Basin to be quite limited. Our team is busy determining market conditions for Alfalfa across the entire Western United States and actively securing inventory in the PSW and PNW to supply our customer needs. Stay updated on this years’ Alfalfa and Timothy Hay harvests on our blog. You can subscribe to this blog from Anderson Hay above on the right.